The latest innovations in mobile surveillance have increased clarity and allow for remote upload of videos, so supervisors have a better idea of what is happening while their bus or train drivers are en route. Engineered to meet the demands of the mass transit industry, the new Vulcan Series V16HCNVR is equipped with Hybrid Component slide-rail technology patented by AngelTrax to help transportation directors keep their fleets out of the shop and on the road more. With slide-rail component technology, this smart storage solution can be serviced or updated in minutes — not days — increasing efficiency by reducing downtime and cutting the long-term cost of ownership in half. The V16HCNVR’s standard configuration records up to 16 high-definition IP camera channels of interior and exterior views at 720 pixels up to 1080 pixels; eight additional IP channels are accessible through an optional external switch, for a total of 24 IP channels. The V16HCNVR also includes an AHD connection for an optional backing camera. When using an active Internet connection, the V16HCNVR can utilize smart 4G cellular/Wi-Fi downloading capabilities to optimize data usage. In addition to top-notch performance as mobile recorders, Vulcan HCNVRs are equipped with power connections for auxiliary systems including, but not limited to, public address systems, signage, and onboard diagnostics. Improved picture clarity is always in high demand, and several surveillance brands have released new cameras with increased resolution and wide-angle lenses to better capture every aspect of a route. REI recently released its HD5 series, a digital DVR that records up to 1080p on each channel. In addition, REI is set to release a 360-degree HD surround view system that utilizes 3D technology for seamless viewing of the vehicle’s surroundings. With increased clarity, Guzallis says it is easier for transit officials to identify incidents, both on the vehicle with a passenger and around the vehicle. The HD5’s 170-degree angle camera is one of the widest camera angles in the industry, and eliminates the need of two or three cameras, Guzallis says. Seon’s Director of Marketing, Lori Jetha, says that advanced mobile surveillance systems can record up to 16IP camera views. With integrated audio capabilities, it is significantly easier to identify people and objects of interest in challenging lighting. 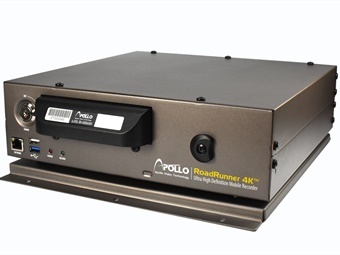 Apollo Video Technology’s RoadRunner 4K™ on-board video surveillance system provides exceptional clarity for transit and rail applications, delivering a clearer picture of activities on and around buses and commuter trains. “Our 4K system brings unprecedented detail and quality and furthers our mission to provide innovative and reliable transportation solutions to protect client assets, while promoting efficiency and safety,” says Rodell Notbohm, CEO of Apollo Video Technology. Coupled with a new, high-definition 360-degree camera, the system empowers transit operators to achieve maximum, panoramic video coverage, virtually eliminating blind spots and coverage gaps. Most systems on the market have a feature to capture certain events, either triggered via g-force or manually by the driver. With REI’s HD5 system, events such as hard braking, speeding, or taking turns too quickly, will trigger G-force parameters and automatically flag that time section of the video recording. The HD5 solution even features an option to customize its notifications dependent on the driver. At the start of a shift, the monitoring system will look for certain events and managers can then assemble a type of report card for each driver. 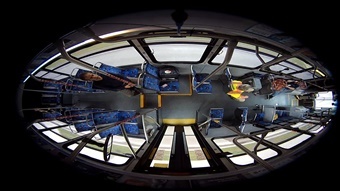 The MobileView 9710 camera captures a high-quality 360-degree panoramic image, delivering security coverage in hard-to-see areas inside a bus. The camera does the work of four IP cameras to deliver clear video evidence for incident investigations. The ceiling-mounted camera provides complete interior coverage, requires less recorded storage capacity, and is cost-effective and easier to install than multiple IP cameras. The six megapixel camera offers simple-to-use post-capture digital pan, tilt, and zoom functionality to zero in on a key incident area for detailed investigation with absolute clarity. A built-in microphone provides synchronized audio for evidence clips. With Rosco Vision Systems’ Dual Vision camera, events that have been triggered by g-force will be saved separately from other non-event information videos. The triggered videos can’t be recorded over until a fleet manager purges the information. Even when the SD card is full, the videos will not automatically delete. Rosco’s surveillance system also features a driver “panic button” that can be pushed to mark an important event that isn’t g-force triggered, such as a passenger slipping or a fight. While the new technology increases accountability for drivers and passengers, it also features privacy protection measures. Seon’s line of products makes it possible to blur peoples’ faces and other objects to protect passenger and employee privacy. 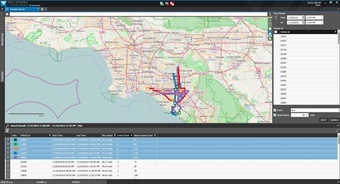 March Networks’ Incident Search is an innovative investigation tool that enables bus and light rail operators to quickly respond to complaints, resolve disputes, and address liability claims using clear video and data evidence. The software integrates onboard surveillance video with recorded vehicle events, including speed, hard-brakes, door malfunctions, and impacts, as well as vehicle routes, dates and times, and geo-location. It enables investigators to run searches based on these combined data points, for example, all buses that recorded a hard-brake in a specific location between 3 p.m. and 5 p.m. Incident Search dramatically reduces the time needed to investigate reported incidents and share accurate evidence. It can also be used proactively to identify possible issues, such as recurring door malfunctions, before more serious problems occur. With REI, any triggered events that happened while a bus is enroute will be automatically flagged and uploaded as soon as the bus returns to its terminal. Guzallis says the video retrieval tool has been aiding agencies with liability protection and potential lawsuits. “We found it actually lowers the amount of calls from citizens making false claims,” he says. In the past, when a passenger made a complaint, the video footage would be manually retrieved; often, when a passenger filed a complaint, the video footage from that day was already deleted. Seon takes wireless retrieval one step further. It offers agencies the ability to stream video in real-time via a secure cell connection. REI recently released its newly designed HD5 Series of DVRs. The DVRs are affordable, scalable, and eclipse industry standards with new features and enhanced capabilities. REI’s ultra-durable systems record video, audio, and vehicle data via a hard drive or SD card. Connect up to 12 surveillance cameras for full video surveillance in and around the vehicle. Surveillance solutions can be enhanced by selecting from REI’s line of high-resolution analog or IP cameras. The HD5 Series is 100% compatible with all existing REI HD Series cables, cameras, peripheral devices, and brackets and is expandable via a communication module that makes upgrading easy for faster communication technology as it becomes available. While surveillance companies are working to create better products that take up less memory space, they are also looking to create more cost-effective solutions for transit providers. “We’re trying to minimize the service and upgrading costs, as well as the long-term costs of ownership, in the transit side, by offering the new hybrid component technology that we have patents on,” says AngelTrax’s Howard. Operators will never have to remove the DVR from the vehicle to repair it, and the new process only takes about 30 seconds to do. “And, to upgrade it, if some new technology comes out, all we have to do is change the main board and you’ve got the new technology,” Howard says. For transit operators, this means that not only is the cost of repair cheaper, but also the long-term cost of ownership. The new systems being distributed by AngelTrax are designed to last up to 10 years, as opposed to the usual three to five. Seon understands that funding isn’t always available for transit agencies to upgrade their equipment every time something new comes on the market. 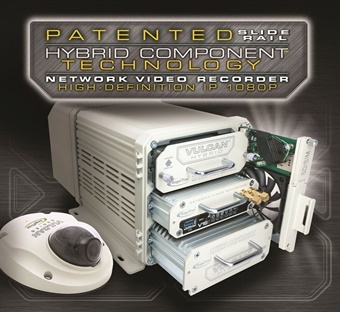 To help, the company’s Hybrid Network Video Recorder supports both analog and IP cameras. 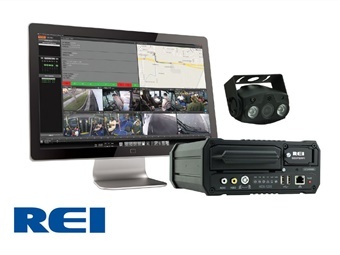 New to Safety Vision, which just celebrated its 25-year milestone, is the enhanced Observer series of Hybrid Video Recorders, which now features Analog High Definition (AHD) technology. AHD allows for HD-quality video and images using standard analog coax cables, delivering greater resolutions at a lower cost. Other additions this year include revamped enclosures, featuring Safety Vision’s blazing red color scheme. 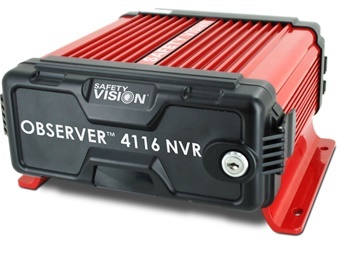 For a more modern network solution, Safety Vision has also released a new addition to the Observer line ­— the Observer 4116 Network Video Recorder. This is the first of the Observer recorders to go completely IP-based, offering the ultimate in image quality and superior digital zoom capabilities. 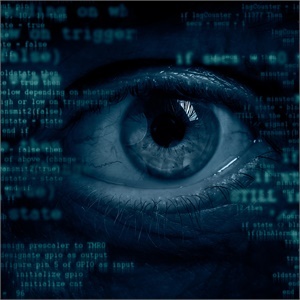 While mobile surveillance units have come a long way in terms of design and functionality, video surveillance companies are looking for even more ways to increase clarity, eliminate storage space, and create more cost-effective products. REI’s soon-to-be released 360-degree HD surround view system will provide seamless viewing, making maneuvering easier for large vehicles. REI will also soon debut a 24-channel network recorder that will record in 1080p. 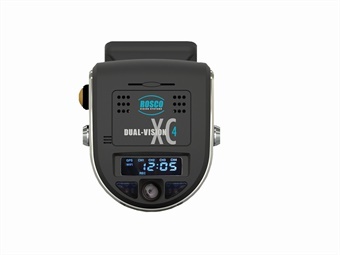 Rosco’s Dual-Vision XC4 Continuous HD Video and Event Recorder is a versatile windshield-mounted recorder, which adds the power of live video and data to any fleet management system. Rosco’s Dual-Vision allows for data retrieval through the physical SD card, and wirelessly through Wi-Fi and 4G LTE. DVXC4 is equipped with a front interior-facing camera and rear exterior windshield-facing camera, with options to connect additional cameras, up to 10 views. All Dual-Vision cameras come with the DV-Pro 5 Data Management Software and the option for RoscoLive Cloud Services. RoscoLive is a cloud storage feature that connects to the DVXC4 recorder, via cellular service, and allows fleet managers to track and trace vehicles on the map and view event and other requested custom videos, including live video streaming from the vehicle using a standard web browser. Dual-Vision XC4 can also integrate with many existing fleet telematics systems.